In 1950 Fiorentina started to achieve consistent top-five finishes in the domestic league. The team consisted of great players such as well-known goalkeeper Giuliano Sarti, Sergio Cervato, Francesco Rosella, Guido Gratton, Giuseppe Chiappella and Aldo Scaramucci, but above all the attacking duo of Brazilian Julinho and Argentinian Miguel Montuori. This team won Fiorentina's first scudetto (Italian championship) in 1955-56, 12 points ahead of second-place Milan. 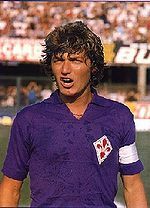 Milan beat Fiorentina to top spot the following year, but more significantly Fiorentina became the first Italian team to play in a European Cup final, when a disputed penalty led to a 2-0 defeat at the hands of by Alfredo di Stéfano's Real Madrid. Fiorentina were runners-up again in the three subsequent seasons. In the 1960-61 season the club won the Coppa Italia again and was also successful in Europe, winning the first Cup Winners' Cup against Rangers. After several years of runner-up finishes, Fiorentina dropped away slightly in the 1960s, bouncing from 4th to 6th place, although the club won the Coppa Italia and the Mitropa Cup in 1966. While the 1960s did result in some trophies and good Serie A finishes for Fiorentina, nobody believed that the club could challenge for the title. The 1968-69 season started with Milan as frontrunners, but on match day 7 they lost to Bologna and were overtaken by Gigi Riva's Cagliari Calcio. Fiorentina, after an unimpressive start, then moved to the top of the Serie A, but the first half of their season finished with a 2-2 draw against Varese, leaving Cagliari as outright league leader. The second half of the season was a three-way battle between the three contending teams, Milan, Cagliari and Fiorentina. Milan fell away, instead focusing their efforts on the European Cup, and it seemed that Cagliari would retain top spot, but after losing against Juventus, Fiorentina took over at the top. The team then won all of their remaining matches, beating rivals Juventus in Turin on the penultimate matchday to seal their second, and last, national title. In the European Cup competition the following year Fiorentina had some good results, including a win in the USSR against Dynamo Kyiv, but they were eventually knocked out in the quarter finals after a 3-0 defeat in Glasgow to Celtic. Viola players began the 1970s decade with Scudetto sewed on their breast, but the period was not especially fruitful for the team. After a 5th place finish in 1971, they finished in mid-table almost every year, even flirting with relegation in 1972 and 1978. The Viola did win the Anglo-Italian League Cup in 1974 and won the Coppa Italia again in 1975. The team consisted of young talents like Vincenzo Guerini and Moreno Roggi, who had the misfortune to suffer bad injuries, and above all Giancarlo Antognoni, who would later become an idol to Fiorentina's fans. The young average age of the players led to the team being called Fiorentina Ye-Ye.